The daylily (hemerocallis fulva) is a very common ornamental plant that has found a home in many yards and gardens throughout the United States. Despite its common occurrence, few realize the year-round food potential of this plant. In this article I’ll go into detail about how to identify, process and eat these delicious plants. Leafless flower stalk that is about 3 feet tall. The stalk that supports the flower head will have no leaves on it. This is a good comparison to the Blue Flag Iris which is poisonous and has leaves on its flower stalk. Light-green basal leaves that are long and sword-like with pointed tips. Root is a tangle of small tubers. The tubers are around pea size to about the size of a large almond. If you can positively identify each of these 4 attributes above, it’s pretty certain that your looking at a daylily. The great thing about daylilies is that there is always something to eat from this plant all year round. In the late Fall and Winter (as well as all year round) you can eat the tubers (root nodules), in the Spring the young shoots are edible and delicious as a stir fry, and in the Summer you can eat the flower buds and the flowers. I would recommend waiting until Summer to eat these as it will have all of the attributes available to make for an accurate identification. Since it’s a perennial plant (lives longer than two years) you can then come back to the stand during the following springtime to get the young shoots. If you do decide to gather them in the Spring, care must be taken not to mistake them with some of the poisonous irises and lilies that emerge around the same time. One of the best ways to identify them is to unearth the young shoot, roots and all. You’re looking to find small potato-like tubers with tiny hair-like roots attached to them (see the picture I took in the section above). 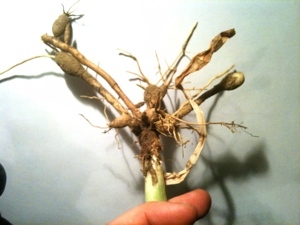 If you unearth one long, thick rhizome without tubers or a single bulb, then you’ve got the wrong plant. The edible portions of the plant (tubers, young shoots, flower buds and flowers) can all be eaten raw. However, there have been reports that some people react with nausea, vomiting, or diarrhea — especially if they eat a bunch of it). Cooking it is supposed to help reduce these effects. Just try out a small amount and see if you have any symptoms. All my friends and family who try this plant have never experienced this. Tubers: You’ll want to remove the hair-like roots and thick rhizomes. Wash and clean them and boil them in water for about 15 minutes for best taste (you can eat them raw). Some people like to peel them like potatoes, however I find the skin is just fine to eat along with the starchy centers — without the hassle. In this picture I’ve peeled some and left others with the skin. Flowers: The flower have a pleasant sweet taste when eaten raw and also can be dipped in batter and fried. Day-old Flowers: The wilted flowers (above-left in the picture) can be reconstituted in soups. Flowers Buds: Both the flower buds about to bloom (bottom left) and those that still have a while (bottom right) are excellent in your favorite stir fry recipe. Young Shoots: The young shoots are excellent raw, in salads or with dip. They are also great in stir fry. The benefit of learning wild edibles is that it can greatly improve and extend your long-term food storage. Here’s an example of using some of my stored rice with some fresh daylily flowers, stir-fried buds, and boiled daylily tubers. Yumm! Daylily flowers and tubers are high in protein and oils. The flower buds are good sources of beta carotene and vitamin C.
Although daylilies are an excellent food source, you should be aware that research done in Chinese laboratories have reported that there are potentially toxic substances in the roots which may be cumulative. Keep in mind that people have been eating these plants for centuries without being poisoned so use them with respect and in moderation.